The Lise Meitner Society is a non-profit organization with the aim to improve equal opportunities for women* in the natural sciences and mathematics inside and outside of academia. It is registered under German Law as the Lise-Meitner-Gesellschaft e.V. Still today women* are underrepresented in the natural sciences and mathematics and face disadvantages and discrimination because of implicit bias, which is often unintentional and hardly visible. We are a group founded by young scientists who aim to raise awareness for these mechanisms, especially in the natural sciences and mathematics. Furthermore our goal is to encourage women* to confidently define and follow their goals. The next I, Scientist conference will take place on 20-21 September 2019 at Technische Universität Berlin! Registration is open now! Early bird until 20 May 2019! 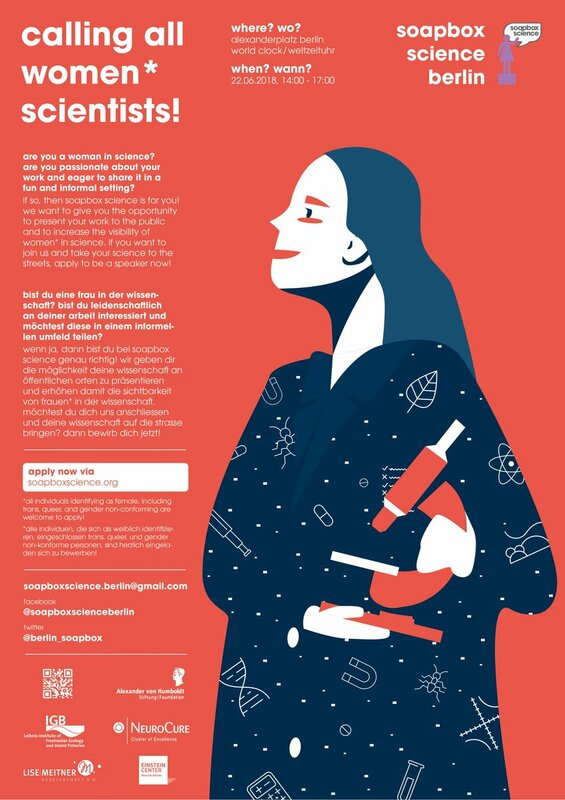 The Soapbox Science event in Berlin will take place on 22 June 2019 at 2 pm on Alexanderplatz! Find more of our appearances in the media here. Mara Oßwald, founder of the LMG and initiator of I, Scientist, was interviewed: "Committed Advocate of Equal Opportunities"